The program helps create ebook libraries and view a full list of books in Book Shelf or Table View modes. Users can add custom categories for effortless organizing of the books added to the program. User can filter the contents by the offered categories that are recently read books, favorites, all books. Added ebooks can be also filtered by formats. Search through the Library is also supported by the program. Icecream Ebook Reader gives you a great reading experience thanks to special features, such as Full screen, Window, and Book modes, quick access to the table of contents and list of bookmarks, bookmarking tool, font size tools, and quick access to the profiles (Day, Night, and Sepia) depending on the time of the day and lighting conditions. Users can also customize the text alignment, background and workground colors. The books can be read in double and single layout. It's possible to copy, translate and search text of the ebooks along with highlighting of the text and adding of notes. The notes can be exported and saved as HTML file. Users can also search through the added notes, edit and delete them. Navigation scrollbar will help you to navigate the book and browse through the pages of the books easier. 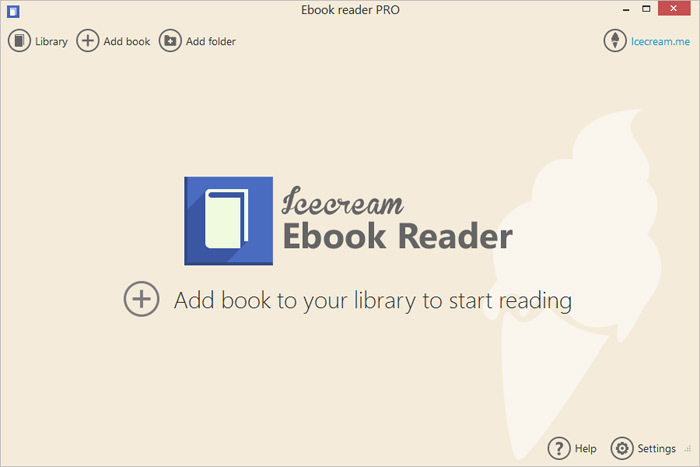 Search within a book by text of page number is supported by Icecream Ebook Reader. The Library of a user can be exported and imported so that the progress can never be lost. Scheduling software for school, university and company timetables. A-PDF Watermark 6.4: Add manipulate watermarks to Acrobat PDF documents. Abex PDF to Flash Converter 3.9: It is easy-to-use and provides the best way to convert PDF to SWF flash Any to Icon 3.57: A wizard converter to produce your own icons from any image or a Mac OS icon Smart SWF to AVI Converter 12.4: Swift and easy conversion from SWF to AVI with batch conversion.